Martha is my guardian angel: her job is to keep me safe. She giggles as she dresses me. It takes a good 20 minutes, as I am not known for my physical coordination skills. Boots, two layers of gloves, impermeable gown, mask, goggles, and helmet: the outfit costs $100, and most of the bits are used only once and then burnt. Her final flourish is to scribble my name on the helmet to identify me among the similarly attired others. And the time of donning my suit is also inscribed – so you don’t stay in the “hot zone” for too long. The heat rapidly builds up and sweat streams down on the inside, my visor fogs up, and I hear my foul breath rasping in my ears. I last 40 minutes but the experienced manage over two hours during which time they must do all they can for the desperately sick. Taking off the gear is the most risky part as a strict sequence must be followed along with the copious spraying of chlorine to ensure that contamination on the outside layers is not transferred to your skin. I finally hop over the painted red line on the floor that demarcates the “clean” from “dirty” areas. Crossing that red line every day is done by local health staff supported by nurses and doctors from the UK National Health Service and from American and other hospitals. 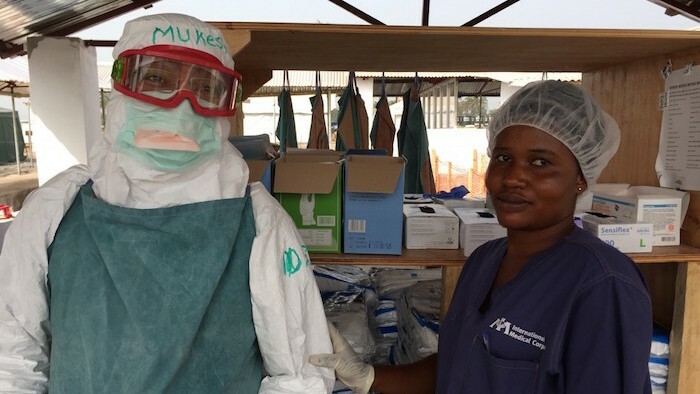 They work with the International Medical Corps at its Ebola Treatment Centres in Sierra Leone and Liberia. IMC is an experienced humanitarian health organisation and I have admired their good work in Afghanistan, Kosovo, and other countries mired in disaster and war. Yes, Sierra Leone (and Liberia and Guinea) is at war again, against a nasty virus that kills most of its hosts. The impression of war is reinforced by the Joint Sierra Leone/UK Task Force command centre from where an impressively coordinated civil-military operation is chasing the virus. Off the Sierra Leone coast lurks RFA Argus, a British naval ship with sophisticated hospital facilities. Curiously she was also there in 2000/01 in support of the UK military intervention to dislodge rebels during Sierra Leone’s lengthy civil war. I am also returning to the region for the first time since the 1990s when I spent so much time on humanitarian work there with the UK Department for International Development. Travelling again along the highway from Freetown to Makeni, the checkpoints bring a sense of déjà vu. But the police are friendly as they direct a temperature scanner at my forehead. A vivid contrast to the drunken or drugged militia of earlier years who pointed guns at us along the same road. There is no cure for Ebola Virus Disease but the special treatment centres have become more practiced at keeping people alive with supportive therapy – including rehydration and a cocktail of antimalarial, antibiotics, and vitamins – to treat other possible co-infections and boost the body’s own defences. Survival rates have improved to about 60% as the sick seek earlier care and specialised ambulance services fetch them quickly and safely. The virus thrives on fear, prejudice, and anger. Burial teams and public health workers have been attacked and the sick hidden away. But this is changing as community outreach and public awareness measures achieve impact. Walls are plastered with graphic cartoons of people feeling feverish, vomiting copiously, extruding diarrhoea, bleeding horribly, breaking out in rashes, or contorting in pain. This is part of nationwide campaigns to educate the public on Ebola disease symptoms. Sensing my melancholy she takes me next to the Survivors Wall. “It’s growing“, she says proudly, indicating the collage of multicoloured handprints – each one from a winner in the Ebola lottery. I watch the discharge ceremony for John, a 23-year old at the Makeni centre. Declared Ebola free, he is given an impressive looking certificate to say so – useful to get his job back and reassure his family and friends. He prepares to leave after a shower and donning brand new clothes. After all, he is miraculously re-born. However, he insists on keeping his old mobile phone – so it is dunked in chlorine for 30 minutes. Another miracle: it still works, and I wonder if my latest model iPhone would survive this. The attending staff line up with drums, and sing and dance him off the premises, along with some money and food for a few days. After, of course, he has imprinted his palm on the survivors wall. This rite of passage is important – signaling gratitude, defiance, and optimism. Survivor John is a cherished community resource – to educate and bring hope to others, and maybe also to care for the sick because he is likely to be immune now. The psychological trauma is profound – a mixture of shame, guilt, fear, and isolation. Mothers can’t cuddle their suspected sick babies; the dead can’t be seen-off in traditional ways. “No touching” and “no handshaking” posters are everywhere. This is hard for West Africans who are a warm and affectionate people. “We are now chasing the virus instead of the virus chasing us”. While new Ebola cases are indeed dwindling, deaths have increased from other serious problems – treatable but unattended conditions such as malaria, typhoid, and pregnancy complications – because normal clinics and hospitals were shut down and protective immunisation programmes suspended. Basic services must get going again without reducing vigilance on Ebola because this can also flare up again. However, the virus did manage to exploit the institutional weaknesses of a health system that had long since broken down. “What happened to the hundreds of millions we gave in post-conflict aid?” I wonder, as I recall the big project documents I had myself written. But I am too polite (or cowardly) to ask the President of Sierra Leone and his Health Minister, as they come by on a morale-boosting visit to a treatment centre. The government really is trying and the authorities are showing leadership. But this is not the time to say anything other than to call for unity and determination against a common enemy. The sentiment is echoed on giant billboards everywhere: “Ebola must go. It is our own responsibility”. However such questions must be asked soon and the right lessons leant. Simply to restore the status quo ante is to be deaf to the wake-up call that Ebola has provided. And our notions on how to help fragile states are deeply flawed. Shortcuts and short-term thinking lead to short-lived results. And a further niggling thought comes from past experience: will the current harmony among international actors – based on mutual self-interest – prevail or will this be overtaken by recriminations and competing development ideologies? A personal footnote: Ebola forces me to know my own body. Inspected every few hours along my travels, I did not realise that my temperature fluctuates so much. Or is this due to the calibration accuracy of the temperature scanners? Anyway, I can’t help the micro-frisson of anxiety every time a sanitary inspector points the machine at me. What if – this time – it is raised? Once this is indeed the case. 38 degrees! But common sense prevails. “You have been walking too long under the sun, haven’t you? Drink this water and rest”, says the kind-looking nurse. Ten minutes later I am “normal” again…. I wish that real Ebola were as easy to tackle.